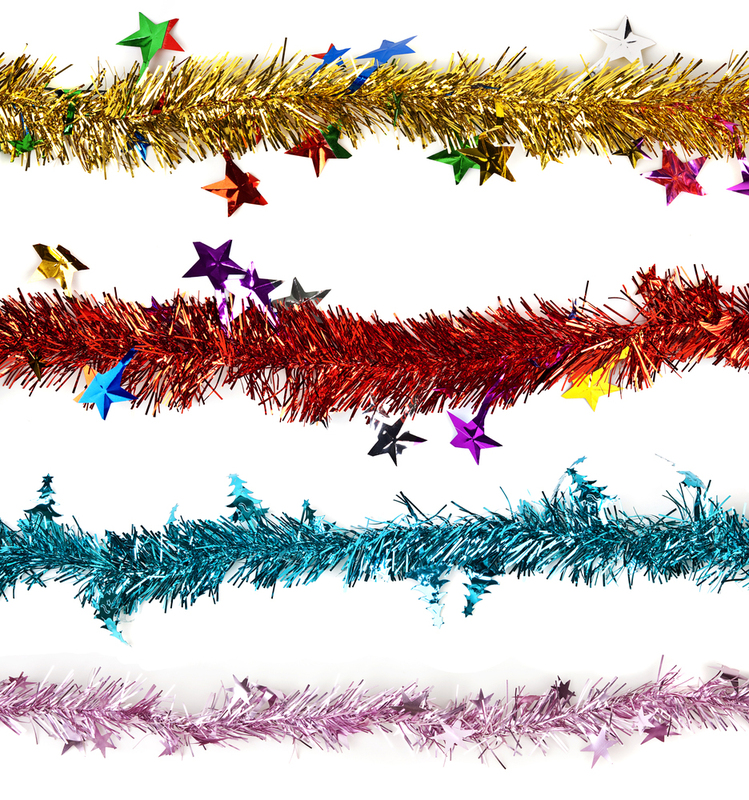 Wishing everyone a very Merry Christmas and a Happy New Year from the CFK Team. Check out our latest e-news, click on link below or scroll down. 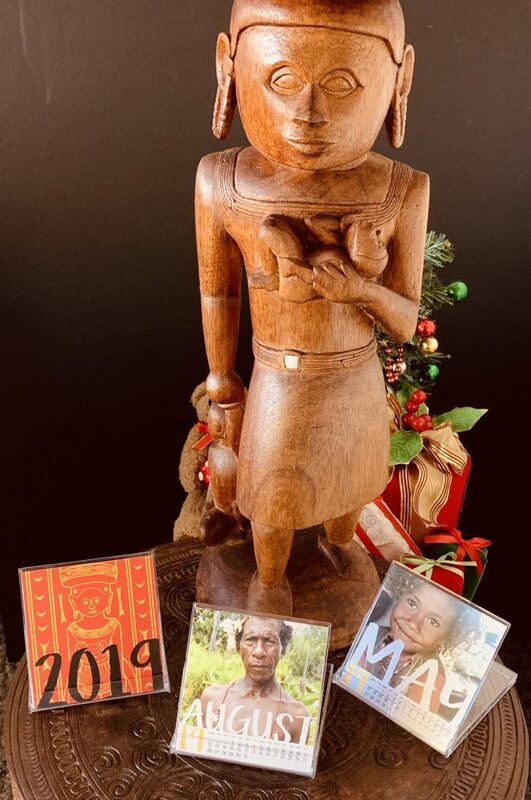 e-NEWS and Merry Christmas to all!! 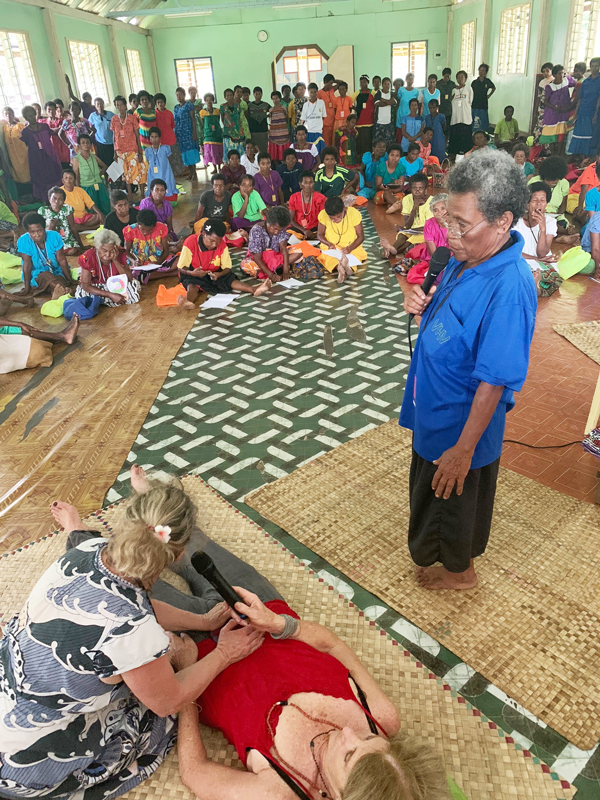 Caring for Kiriwina Village Birth Attendant Training in October 2018: Intrepid CFK midwives; Jacqui Andrews and Shea Caplice in action with Midwife Bokowau translating. It takes a lot of good hearted people to allow Caring for Kiriwina to achieve the great successes it has so far in it’s 6 years of existence. We would like to thank our wonderful CFK Team from Australia, intrepid Midwife Educators Shea Caplice and Jacqui Andrews; intrepid Deputy VBA Programme Head Vanessa Palfreeman; our in-country Head Toks Bwaina; our on-Island Head Lepani Ahab; our in-country training partners Ridley and Meisy Mwaisiga, Bokawau and Leness; our head VBA’s on the Island Ruth Boaz and Dulcie (and husband Nelson) Toposana and our hundreds of CFK members on Island. complete a successful Village Birth Attendants (VBA’s) training program this year which included 210 participants, all done in partnership with the Losuia Health Centre. supply over 3,500 birthing kits Island wide. review and adjust the contents of our birthing kits to include muslin wraps and washable menstrual pads. 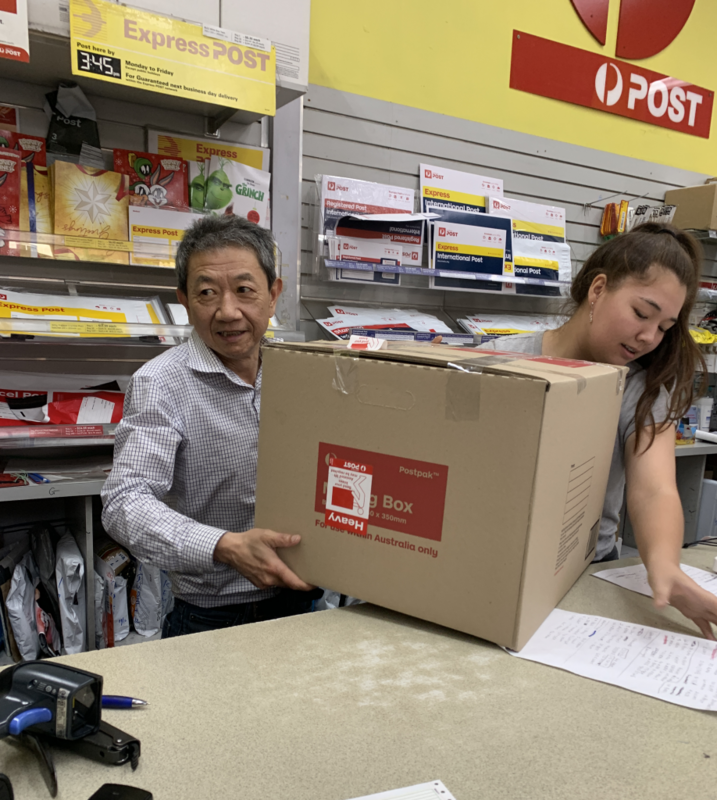 supply over 100 torches and lanterns (some currently awaiting clearance in Moresby) to the VBA’s as well as thongs, uniforms and jumpers. investigate options for additional training of birth attendants as a result of the successful Friendship Grant application. At Losuia Health Centre Office in October pictured from left: Health Officer Ridley Mwaisiga, CFK Midwife Jacqui Andrews, Front: Midwife Bokawa, behind Raymond. CFK Midwife Shea Caplice, Losuia Health Centre Nurse Meisy Mwaisiga and Jodi Lawton. We are so thrilled that Caring for Kiriwina has been successful in our recent application to DFAT for an Australian Aid Friendship Grant! 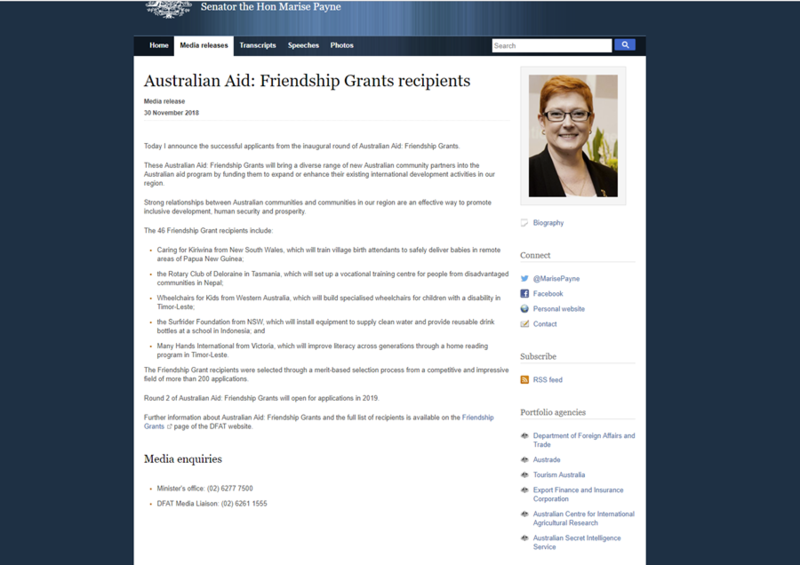 See screen grab below from the DFAT Friendship Grants announcement and CFK is first in line. Thank you so much to the Australian Government! We will not let you down. 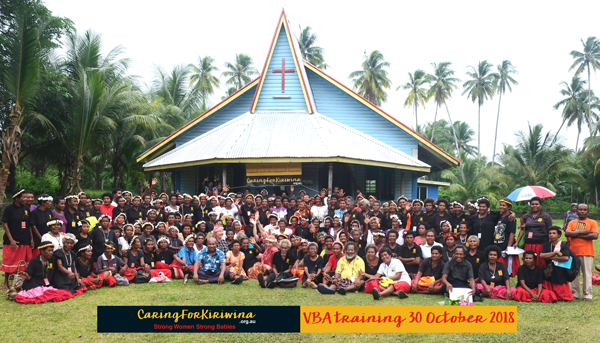 The Village Birth Attendant Training Project is supported by the Australian Government and implemented by Caring for Kiriwina. Thanks again to all our donors for your ongoing support! There have been multiple hurdles delaying the delivery of these headlamps to our wonderful VBA’s on Kiriwina. 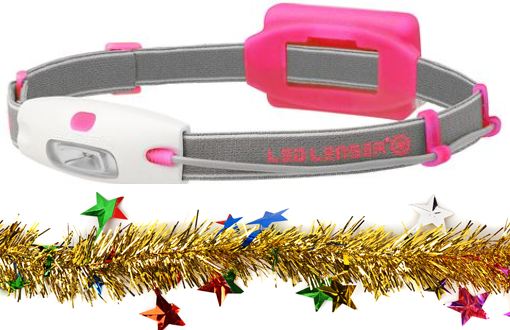 The headlamps are currently in customs at Port Moresby, and we can’t resolve this until the new year. Fingers crossed this process will be resolved quickly in early 2019 and these much needed headlights will soon be assisting our Village Birth Attendants. You too could own one of these limited edition CD case desk calendars, simply click on the link below and head to our shop. For only $35 we can Australia Post a copy to you asap. 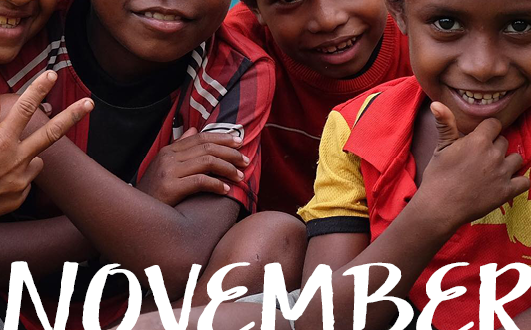 All proceeds go towards our Caring for Kiriwina vital projects. 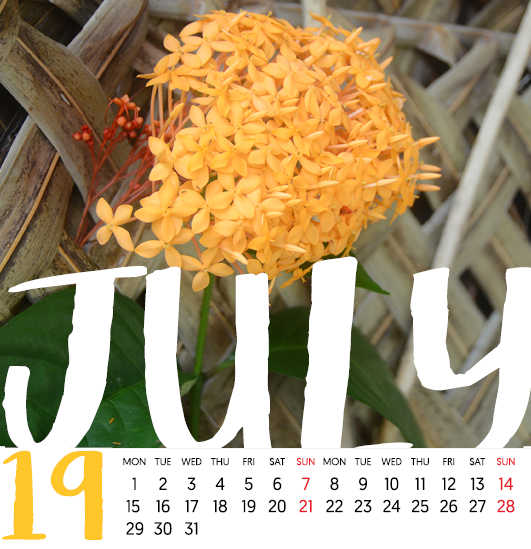 The calendar case size is a very functional 95mm square, it does not take up too much space on your desk. You don’t have to keep opening relevant screens on your computer and devices, all the information is always in view. Sometimes old school works best! Tony Abbott congratulates CFK on our successful grant application. We were excited to receive both a phone call congratulating Caring for Kiriwina, followed up by this letter of support. 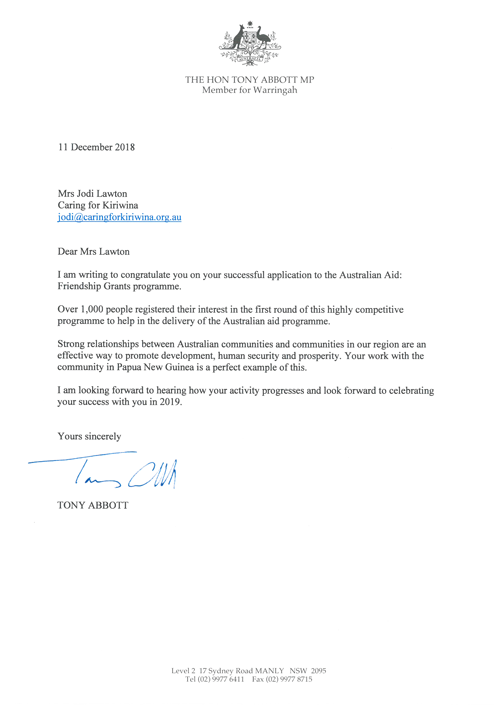 We are pleased to receive such high level government endorsement for our activities and thank Tony Abbott for his engagement with Caring for Kiriwina. In memory of the late GREAT Margaret Lawton. 4 years today. Founder of Caring for Kiriwina. 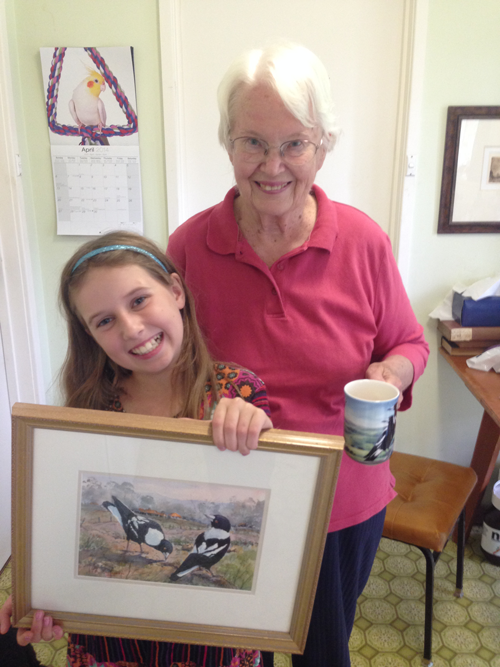 Here with her granddaughter Lila Lawton. We miss her every day. Our In-Country Manager will be flying over from Alotau to Kiriwina towards the end of December with boxes and boxes of essential items. 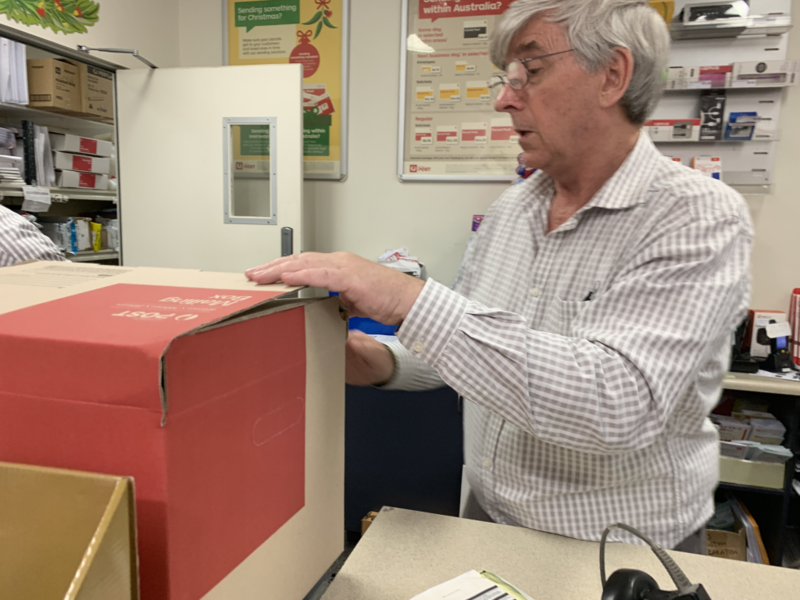 The x 74 headlamps were mailed yesterday and x 50 Birthing Kits including underpants and additional fabric/ reusable/washable menstrual pads have been sent to replace the disposable pads normally used. Rubbish is a massive problem on Kiriwina and hopefully this will help reduce the amount of rubbish on the Island. 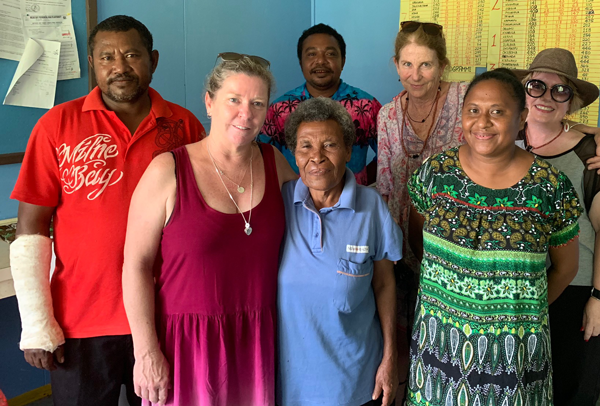 We are thrilled to announce – Caring for Kiriwina has been successful in our recent application to DFAT for an Australian Aid Friendship Grant! ANU Emeritus Professor Andrew Pawley BA (NZ), MA, PhD (University of Auckland), FRSNZ, FAHAEmeritus Professor, School of Culture, History & LanguageANU College of Asia and the Pacific) and the Rev. Dr. Ralph Lawton editing the latest draft of the Dictionary. Thank you so much Professor Andrew Pawley and colleagues for continuing to support the final publication of this epic project. 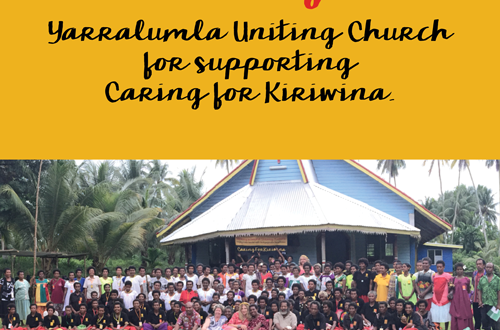 Since Caring for Kiriwina’s inception in July 2012, Yarralumla Uniting Church has supported our vital work to allow us to continue Margaret and the Reverand Dr Ralph Lawton’s legacy of love and support for the Kiriwinan people. Yarralumla Church parishioners also continue to support the family to allow the blind Ralph Lawton to live at home at 90 years of age. Thank you so much from the bottom of the our hearts.